Piccolo and Piano. Composed by Leos Janacek (1854-1928). Edited by Jiri Zahradka. Sheet music. Henle Music Folios. Classical. Softcover. 14 pages. G. Henle #HN1143. Published by G. Henle (HL.51481143). The little march composed in 1924 forms the nucleus of the suite for wind instruments Mládí (51481093 / 51487093), in which the jaunty flute theme weaves through the 3rd movement. 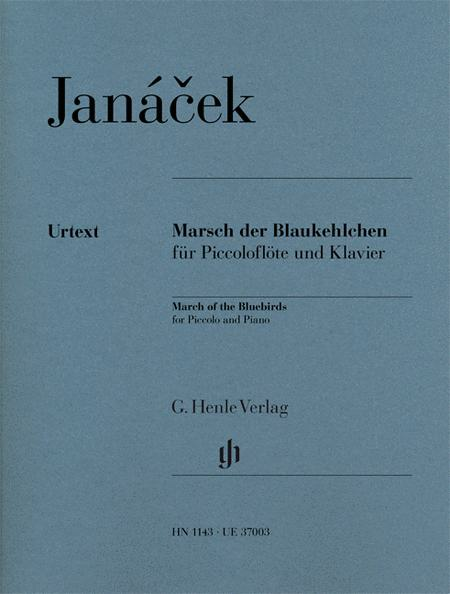 Incidentally, the “bluebirds” do not refer to birds but to the light blue robes worn by the choristers at the monastery in Brno, which Janácek entered at the age of eleven. Almost 60 years later during a visit to Potsdam he remembered the Prussian troops' invasion of Brno and, with this in mind, wrote a chamber music miniature with a military element. 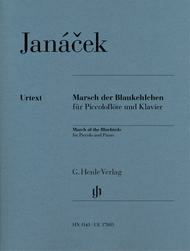 Henle's Janácek edition by Jirí Zahrádka, a specialist on the life and work of the great Czech composer, contains top-quality Urtext as well as detailed information on the work's genesis and transmission.